Religions perceive their doctrines not as opinions or subjective personal preferences, but as demonstrable facts, supported by historical documentation, experience, observation, and logical inference. The most dogmatic believers inhabit a mirror-image universe to that of science, with its own data sources, technical literature, rules of evidence, and means of reaching consensus. When scientists deal with issues like creationism, the widespread failure to understand how religions regard their doctrines frequently results in miscommunication and ineffective, even counter-productive, strategies. The unspoken assumptions made by scientists and dogmatic religious believers are so different that in extreme cases meaningful communication may be impossible. Geologic fieldwork requires much more than knowledge of the basic skills learned in the standard undergraduate curriculum. Synthesis of the skills into a mental construct called a schema must be done before one can address the kinds of problems that arise when doing field investigations. Schema-development cannot be taught explicitly, but a teaching strategy that includes gradational sets of exercises contributes to the kind of synthesis that is needed to develop a functional understanding of a subject. Appropriate use of descriptive geometry and trigonometry in Structural Geology courses does two fruitful things: it provides students with sets of tools they need to analyze three-dimensional structural patterns, and it stimulates the ability to visualize in three-dimensions. Both of these results are needed to develop a functional understanding of a complex project such a mapping exercise in a moderately complex area. The purpose of this article is to provide an integrated approach to make science teaching and learning more effective, interesting and motivating to students. Team teaching by the physics and geology departments enable students to learn the concepts and principles of physics and then apply them to solve geological problems facing the local community. A hands-on approach to science teaching has made science interesting to students, motivated them to learn science and provided effective learning and understanding of the scientific process. An appropriate balance of laboratory experiments, field studies and computer analysis of data is maintained in the course. Field studies include seismic, electrical, gravity and magnetic methods to assist local villages in solving their environmental and hydrologic problems. Students are exposed to real problems and learn how to acquire, analyze and interpret scientific data. The impact of this approach on students is immense and serves to impart in them a positive attitude and appreciation of science. A typical response by students is that they have enjoyed and are motivated by working on "real-world" problems. A program preparing graduate students to teach was developed in the School of Oceanography, University of Washington, in response to repeated graduate student complaints about the lack of a program. The program is based on surveys of groups affected by the program and research on TA preparation, rather than on the personal preferences of the faculty, to ensure partial ownership by all groups. It is aligned with the reform of science education, as are the educational perspectives of the graduate students. It consists of a two-day Orientation for new TAs, peer assistance and peer mentoring for TAs, and an ongoing series of courses and brown-bag discussions. Program preparation took two years: one to prepare a program plan, the second to develop, with the help of graduate students and postdocs, the workshops comprising the Orientation. The first Orientation was held in September 2000 and was evaluated very favorably by the participants. The ongoing part of the program consists of an autumn quarter course on teaching methods, winter quarter weekly brown-bag discussions, and a spring quarter course taught by the Lead TA. Participation in developing the program, leading Orientation workshops, and teaching a course as Lead TA is valued highly by graduate students. Many K-12 educators never experience active learning processes in their science courses that are part of their formal teacher preparation program because of the prevalence of the didactic teaching approach (lecture-read-answer) used in undergraduate science classrooms. From an educational perspective there are substantial benefits to experiencing the process of science through active learning strategies. A 16-week, one semester course entitled, "Earth Systems Science for Educators" has been designed at the University of Nebraska-Lincoln to use an active learning approach to improve student knowledge of basic Earth science concepts. To evaluate the extent to which their knowledge has improved, we developed a fairly simple assessment instrument, which consists of 38 statements in which the student responds true-false-"I do not know." Based on pre- and post-course assessments of 108 elementary and middle-level education majors who took the class in 5 different semesters from 1998 to 2000, there was an average increase in their content knowledge of 30 percent. The Rock Cycle is a useful pedagogical device. Science-fiction novelist James G. Ballard published a colorful description of a nameless fictional world in 1957 that has an artificially closed Rock Cycle. Were such an anthropogenic cycle instigated for Earth, it would be consistent with James Hutton's viewpoint on the Earth as a self-repairing machine without an endogenetic end to planetary Geological Time in sight. The fictional world imagined by Ballard can be used as a teaching example in Earth System Science because it will appeal to youths reared with Science Fiction publications and television and because the visual appeal of Ballard's images are so compelling to unfettered minds. Students in a laboratory techniques course for preservice teachers were engaged in an activity that was designed to assess their skills in identifying geologic materials and model a situation that might be encountered by new teachers. 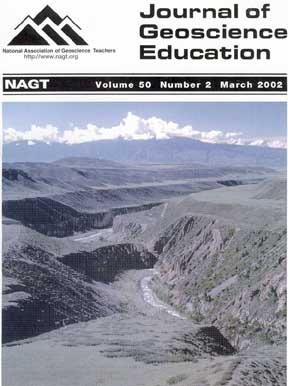 Related activities were designed to give the preservice teachers practical experience in obtaining geologic specimens, labeling them and storing collections. The materials to be identified in this activity (Mr. Chalkentalk's collection) comprised a large volume of mixed and unlabeled samples from an actual secondary earth science classroom. Following the activity, the sorted and identified samples were returned to the ninth grade teacher, thus providing a service learning experience for the college students. Overall, the students performed well in the separation and classification/identification of the materials in the Chalkentalk collection. Samples that were not fit for use in the secondary classroom were recycled. Students evaluated the completeness of the newly organized teaching collection. Using science supply catalogs, they prepared purchase orders for presentation to their "department chair." Insufficient funding led the students to brainstorm for alternate sources of teaching materials. Techniques for organizing and storing samples and logistical considerations for presenting the materials to secondary school students were also explored. Computer-generated animations form a powerful tool for geophysical education. The realistic animations, computed from more than 100,000 normal mode synthetic seismograms, show the manner in which seismic shear waves propagate across the mantle from hypothetical earthquakes. The visualizations provide an understanding of seismic wave propagation that cannot be gained from more traditional ray-tracing techniques.